Taking care of what is under our feet has become more important than it used to be. The reason for this is not that we have become more fragile, but that we also started caring about our environment. Today, we are aware that environmental aspect is as important in a material as it is the quality with which it performs its function. With environmentally friendly products and procedures becoming a requirement for everyone who strives to have a modern business, it is more important than ever to know what’s beneath your feet. Alsco’s Evolution Mats are produced with all these aspects in mind. Made from recycled materials, they are ready to answer to all the challenges of a modern workplace. Of course, being ‘green’ means more than hygiene – there needs to an impact made on the greater environment. The Evolution Mats range is made from re-engineered and recycled materials, which means there are no raw materials used in the manufacturing process. Besides the obvious advantages of recycling rubbers, plastics and other fibres have, recycling means less water and energy is used in making these mats. According to the European Tyre Recycling Association, for example, the energy required to produce just 1kg of tyre rubber from virgin materials is 121,000 BTUs, while the energy used in using recycled rubber is less than 2% of that figure – just 2,200 BTUs. 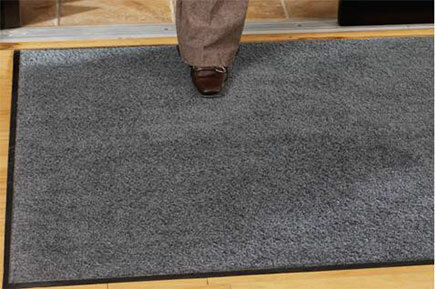 Just like the ‘Welcome’ mat on the doorstep of a home, workplace entrance mats allow people to leave the dirty of the street at the door. But there is more to it than just dusting the soles of our boots. Textile floor mats are ideal breeding grounds for microorganisms (or microbes), like bacteria and fungi, dropped off and picked up as people walk over fibres. In fact, research has shown that as many 5,000 bacteria exist in each square inch of footwear. But the development of anti-microbial mats means that this no longer is a problem. Antimicrobial compounds now used in mat rubber, and treatments used on fibres, actually inhibit the growth of bacteria and fungi to provide a cleaner and healthier work environment. In terms of staff health, anti-fatigue mats in the Evolution Mats range can counter the negative impact that standing for long periods can have on staff. More pressure-absorbent rubber and other materials, as well as thicker piles with cushioned bases, help alleviate the problem. In numerous studies, these mats have been shown to lead to reductions in staff absenteeism and injury, and increases in productivity. This is the logical use of mats, especially when the floor surface is smooth and liable to be slippery when wet. Hotel lobbies come to mind, but many workplaces require these mats, like industrial work floors, garages, commercial kitchens, bars and restaurants to name just a few. Mats offered by Alsco are hydrophobic, which means that they are made to be water resistant. They are also designed to always stay perfectly flat, thus eliminating the occurrence of potentially hazardous dog-ears and ripples. This means that Alsco’s mats are made to be as safe as possible, while at the same time retaining quality and durability. But Evolution Mats aren’t just good at fulfilling their primary purpose. They are also great because they are made of environmentally friendly recyclable materials, which means that they leave a minimal carbon footprint. It is hard to overstate the benefits of a green office to your business. It provides your employees with a place where they will be happy to work and gives your clients one more reason to do business with you. 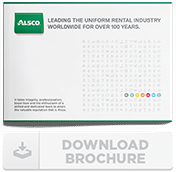 Alsco’s eco-friendly Dust Control & Floor Protection Mats, Wet Area Mats, Anti-Fatigue Mats, Personal Mats, Message Mats are a perfect match for an office which strives to be environmentally responsible. If you want to see the ways in which you can obtain Alsco mats, or you have some further questions, feel free to contact Alsco right now!